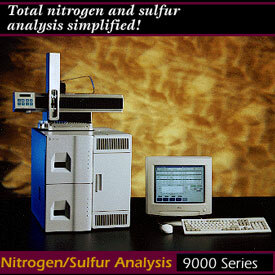 Houston, Texas: July, 2000 - Using proven, patented technology, 9000 Series Analyzers from Antek Instruments, Inc. perform total nitrogen and/or total sulfur analyses. Systems can be configured for nitrogen only, sulfur only, or simultaneous nitrogen/sulfur analyses in gas, liquid, or solid samples. They comply with ASTM D4629, D5176, D5453, D5762, and D6069. More stable than coulometric methods, more sensitive than x-ray, safer and faster than Kjeldahl, 9000 Series Analyzers provide fast, accurate, and precise results in as little as 30 seconds. They feature a data handling system with 32-bit, WindowsT-based, custom-designed software that provides data acquisition, analysis, and storage, as well as programming and control of the analyzer and all accessory instrumentation. Remote instrument operation and real-time analysis support are available via pre-configured modem. Applications include gasoline, lube oils, polymers, and their additives; diesel, coal, pharmaceuticals, pesticides, LPG/natural gas, foods, water & wastewater, and many others.